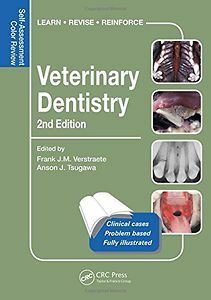 This new edition in the established and well-respected series Veterinary Self-Assessment Color Reviews covers all aspects of veterinary dentistry. Each case consists of one or more questions, illustrated by stimulating visual material including imaging and color clinical photographs. The 228 cases appear in random order, just as they would in practice, and are presented as self-assessment problems comprising integrated questions and detailed explanations designed to educate as well as to provide answers. Written by well-respected experts in the field, this new edition of a bestseller has been completely updated and includes more than 50 new cases. The book is an excellent resource for exam preparation or for practitioners in their continuing professional development.